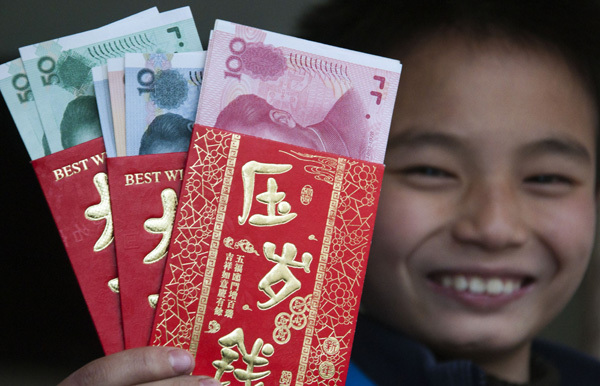 The tradition and true meaning behind the giving of red envelopes to children during Spring Festival is being lost as people stuff them with ridiculously large amounts of cash or use them as a networking tool to cultivate favors in return, experts warn. The tradition of handing out red envelopes started 2,000 years ago during the Eastern Han Dynasty (A.D. 25-220), aiming to protect children from a monster named Sui that brings misfortune. They are normally given to children up to their 18th birthday or, in some cases, when they get their first job. Chen Hewen, 50, owns a wedding company, and tried to dissuade friends and relatives from giving large sums of money to his 12-year-old daughter, who just started middle school. Despite his efforts, the girl still managed to get more than 7,000 yuan ($1,150), double the amount of last year. Her father kept his donation to 200 yuan, an amount he has stuck to for seven years. “I think it’s pointless to give my child that much money,” he said. A Beijing News survey this month of 90 primary and middle school students found that the recipients got 438,000 yuan, an average of 4,867 yuan each. The survey indicated that children whose parents worked in the government or business tended to get more money in the envelopes and from more people. “It used to be of no real monetary value at all. The red envelopes used to have specially designed coins. It was like that for hundreds of years,” said Wu Xinfeng, a senior member of the Chinese Folklore Society. A Chinese language teacher at Xizhongjie Primary School in Beijing’s Dongcheng district, who only gave her surname, Xu, has seen a huge growth in the use of the envelopes given to children in the 6-12 age group as well as the cash they contain. This year, Xu had a student claiming he received 50,000 yuan. Of course, this does not apply to all students. Xiang Pengyu, 13, always receives 2,000 yuan, no more, no less, since the first time he opened an envelope in third grade. His father, Xiang Dong, 46, a Sichuan-born chiropractor at Beijing Massage Hospital, is careful about the 2,000 yuan limit. For that reason, Xiang’s father refused all offers from people outside his family to give money to Xiang. “I don’t want to waste time and money sending it back and forth,” he said. As a result, Xiang only gets the lucky money from his parents and four relatives.